Seven months after it denied an opposition presidential aspirant the use of a public space, the Abuja management approved the same venue for President Muhammadu Buhari and the ruling party. The authorities of the Federal Capital Territory (FCT) on Thursday allowed the Progressives Congress (APC) to use the Eagle Square in Abuja for its presidential rally. The authorities had in August 2018 denied Rabiu Kwankwaso, a former governor of Kano State, the use of the same venue for the declaration of his presidential bid. Mr Kwankwaso at the time was a major presidential aspirant of the Peoples Democratic Party. The venue had initially been approved for him and he had made the necessary payments. However, about a day to the rally, he was told he could not go ahead. The Abuja authorities who manage the Eagle Square said then that the decision to deny Mr Kwankwaso the venue was because his rally was scheduled for a "work day." "We are sorry to inform you that the event can no longer hold on the said date because it is a political event and the 29th of August, 2018 happens to be a work day, as it would disrupt the usual workflow of the Federal Secretariat." Letter of approval allowing Kwankwaso to use the Eagles Square for his presidential declaration. Although Mr Kwankwaso and many observers believe the decision was political, the Eagle Square management claimed its initial approval of the venue to Mr Kwankwaso on a 'work day' was an "oversight." "We apologise for the oversight on our part to note the date in relation to the nature of the event. We regret every inconvenience caused by this," part of the letter addressed to the Kwankwaso Campaign Organisation read. Mr Kwankwaso, a senator, was thus forced to use another venue for his formal presidential declaration. The Abuja administration would, however, ignore its 'rule' for the president and the ruling All Progressives Congress (APC). On Wednesday - a work day - the APC held its Abuja presidential rally at the Eagle Square. As expected, the rally caused discomfort to workers at the federal secretariat and other persons working close to the Eagle Square. Some commuters who spoke to PREMIUM TIMES said routes along that axis were blocked at the time of the campaign. The APC rally was attended by the president and top party leaders including the party chairman, Adams Oshiomhole, and Kogi State Governor, Yahaya Bello. At the rally, Mr Buhari pledged to continue his fight against corruption. He also vowed to probe the alleged $16 billion spent by the Olusegun Obasanjo administration on power projects. Ex-President Obasanjo, an ally of Mr Buhari in the 2015 elections, is now one of the most vocal critics of the president. 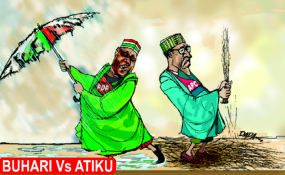 He has thrown his weight behind Atiku Abubakar, the PDP presidential candidate. When contacted on the reason for allowing the APC rally on a "work day" when it barred Mr Kwankwaso's, the spokesperson for the Federal Capital Territory Administration, Richard Nduul, declined comment. He simply said "We don't have a responsibility for any rally. So, I cannot say anything." Similarly, the FCTA minister, Mohammed Bello, through his spokesperson, Abubakar Sani, declined comment. He said questions should be referred to the management of Integrated Facility Management Services. "Please contact the facility managers," he said in response to a text message sent to him. Calls made to the telephone numbers provided by the facility managers in their own official documents did not go through on Wednesday. PREMIUM TIMES reported how the excuse of a 'work day' provided by the facility managers is baseless, strengthening the claim that the decision was political. Apart from approving it for the APC rally on Wednesday, the same venue has in the past been released for other political activities on weekdays. On July 10, 2018, a work day, the Eagle Square was approved for a political rally by the Buhari Youth Organisation. Also similar to Mr Kwankwaso, then-candidate Muhammadu Buhari on October 14, 2014 (a Wednesday, work day) officially declared his intention to contest the 2015 presidential election at a political rally at the same venue.